Our galaxy is called the Milky Way, because its appearance on a dark night reminded the ancient Greeks of spilled milk. The word "galaxy" has its root in the Greek word for milk, galactose, because astronomers knew of only one Galaxy, our own, until the 1920s. The words "Milky Way," "galaxy," and "universe" were used interchangeably back then. Even today, the "Galaxy" usually refers to the Milky Way. While our home Galaxy - once thought to be the entirety of the universe - is now known to be only one of many billions of galaxies, we can still be proud of the Milky Way. Not only is our galaxy a spiral, the most beautiful kind, but it is also one of the two dominant members of the Local Group of Galaxies. Within a diameter of about 100,000 light-years, the Galaxy has over 100 billion stars. The stars in the small central bar, in the huge spherical halo, and in the globular clusters, are mostly ancient. Most star formation now occurs within clouds of gas and dust in the spiral arms, which form a thin disk, only about 3,000 light-years thick. The surrounding disk of atomic hydrogen gas has a diameter of about 165,000 light-years, while the mysterious dark matter, detectable only by its gravitational influence, extends out to at least the two major satellite galaxies - the Magellanic Clouds - and probably well beyond them. Learning the nature of the Milky Way, and our place in it, has been a slow process of looking into our telescopes and studying the other spiral galaxies laid out before us. Those that are face on to us display a brighter central region that usually contains a prominent, almost starlike, nucleus. With enough aperture, the larger, but fainter disk of some nearby galaxies can be resolved visually into mottled spiral arms. Long-exposure photographs make the arms much more obvious, and reveal supergiant stars and little knots of light. Spectroscopes show these knots of light to be star clusters and nebulae, just like those in the Milky Way. The sky offers a continuum of spiral galaxies that are oriented at angles increasingly farther away from face-on, all the way to some that are almost edge-on. The edge-on spirals, like NGC 4565 in Coma Berenices, looked very familiar to astronomers who had studied the naked-eye appearance of the Milky Way from the isolated dark mountaintops where observatories are located. 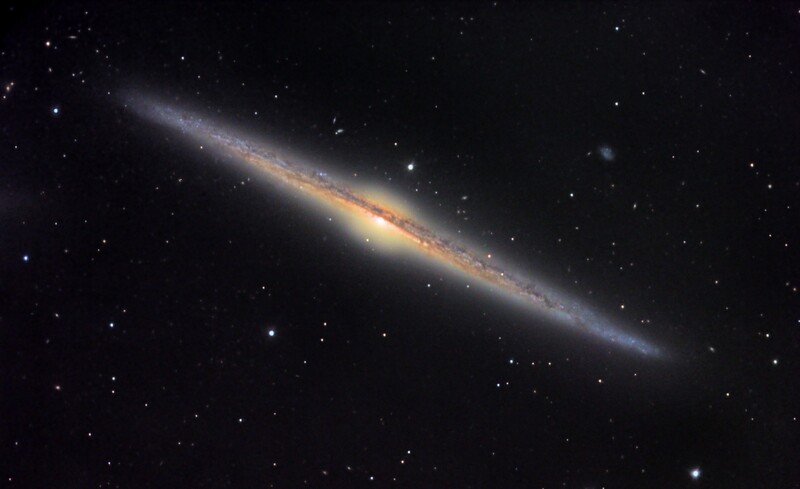 NGC 4565's very thin disk has dark dust clouds along its length, and there is a round and brighter central bulge. The equatorial dust lane of NGC 4565 is most prominent where it crosses this central bulge in silhouette. In order to view these wonders of the Milky Way, you must do so from a true wilderness site, one completely free of light pollution or moonlight, when the constellation Sagittarius is at its highest. The effect is more impressive from the Southern hemisphere, where Sagittarius passes through the zenith. You will see the mottled Milky Way stretch across the sky from horizon to horizon, with a band of dark dust clouds, called the Great Rift, marching down its center, all the way from Deneb to Alpha Centauri. The Milky Way widens significantly in Sagittarius, southern Ophiuchus, and Scorpius. Thus, from naked-eye observation alone, you can deduce that the Milky Way is an edge-on spiral galaxy. The same dust clouds that provide these visual clues also hide our Galaxy's core. While an 8-in (200 mm) telescope easily reveals the nuclei of hundreds of galaxies, the largest optical telescopes on the planet cannot see the Milky Way's nucleus at visual wavelengths. Radio telescopes made the first breakthroughs in mapping the Galaxy. The distribution of atomic hydrogen was mapped by its strong signal at a wavelength of 21 cm. Next, the clouds of molecular hydrogen were mapped, using the knowledge that molecular hydrogen is always accompanied by trace amounts of carbon monoxide. Although molecular hydrogen cannot be directly detected at the temperatures of molecular clouds, typically about 10K/ -441F /-263C, carbon monoxide radiates at millimeter wavelengths. Radio telescopes eventually charted the Milky Way, revealing a barred spiral with many arms that, perhaps, resemble NGC 6744 in Pavo. At the Sun's distance from the Galaxy's center - 28,000 light-years - each orbit around the core at a velocity of about 135 miles (220 km) per second takes 230 million years. The Sun has no connection with any spiral arm - it just passes through them while orbiting the Galaxy. The Galaxy spiral arms have been named. The Sun is on the inner edge of the Local Arm, frequently called the Orion Arm. When we view this arm, we are looking away from the galactic center. Three bright star clusters, The Beehive, the Pleiades, and M7 all lie near to us. Looking toward the outer end of the Local Arm, we see the supergiant star Rigel, the three stars of Orion's Belt, the Orion Nebula, and Monoceros's Rosette Nebula. Looking inward along the arm, we see the supergiant star Deneb, the Veil Nebula supernova remnant, and the North America Nebula. Supergiant stars are always associated with a spiral arm, because their short profligate lives are over before their orbit takes them far from their birthplace. The next arm outward is the Perseus Arm, including the famous Double Cluster. Beyond, lies another spiral arm, called the Outer Arm. Looking toward the galactic center, we see the Sagittarius Arm. As we look inward along this arm, we see the active star-forming regions M8, the Trifid Nebula, the Swan Nebula, and the Eagle Nebula. Looking outward toward the tip, we view the Eta Carinae Nebula and its many attendant open clusters. The molecular clouds on the inner edge of the Sagittarius Arm hide most of the Galaxy's central regions. But we do get glimpses, between dust clouds, of the next two inner arms, the Scutum-Crux Arm and the Norma Arm. The dense stars in M24, the Small Sagittarius Star Cloud, are a small section of the Norma Arm, seen through two intervening spiral arms. Current Research indicates that the Norma Arm contains the most massive molecular clouds, and exhibits the greatest rate of massive star formation within the disk. Although we have named six spiral arms, the Milky Way is currently thought to have only four major spiral arms. Firstly, the Local Arm is not considered to be one of the major arms - it is suspected to be just a spur, attached to either the Perseus or the Sagittarius arms. 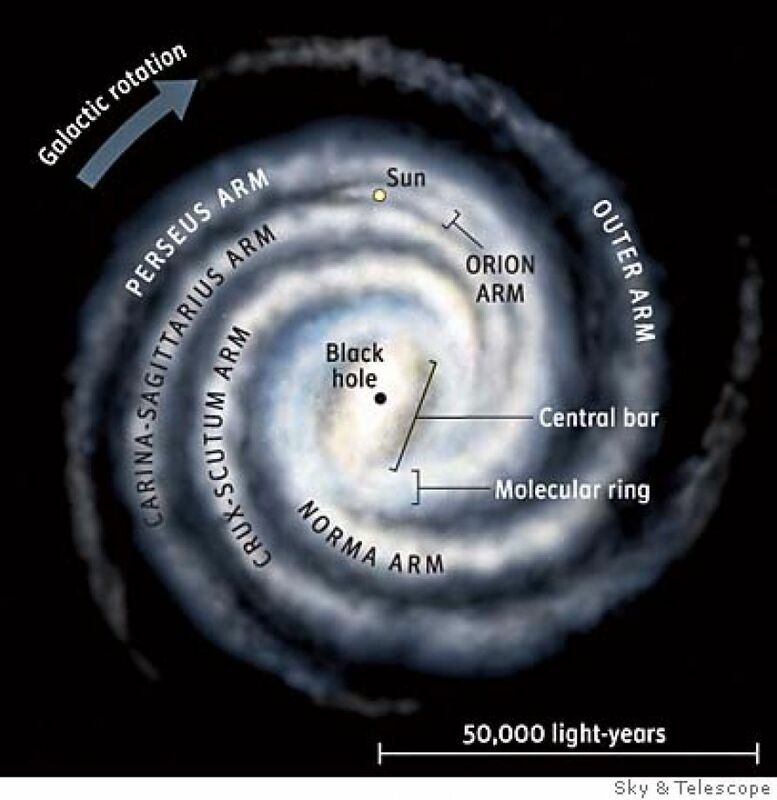 Secondly, many galaxies display nearly-encircling spiral arms, and that is suspected to be the case with the innermost arm, the Norma Arm, and the Outer Arm - they are thought to be the root and the tip of the same arm. 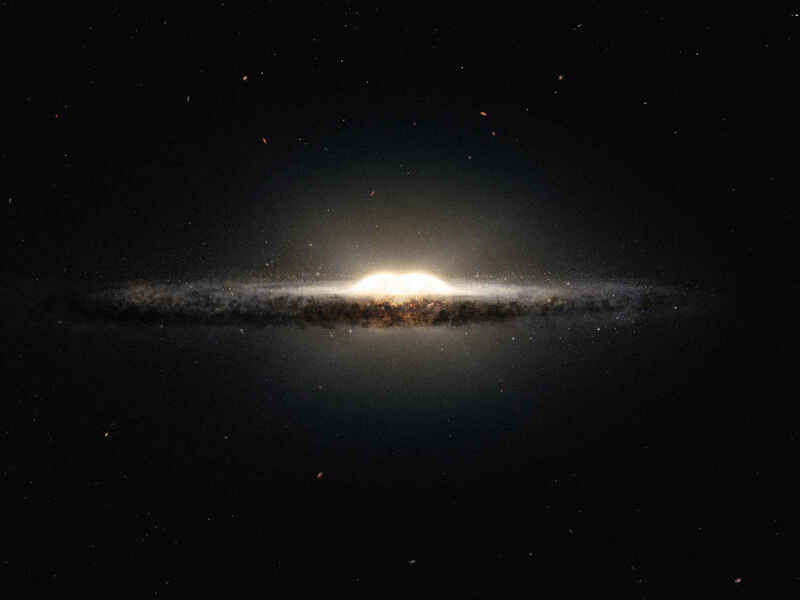 The Milky Way's star-forming disk is embedded within its spherical halo. The halo includes the globular clusters, as well as a thin population of stars. However, the halo is far from empty. Its mass, consisting primarily of dark matter, is ten times that of the disk. Most halo stars are red dwarfs, much older and fainter than the Sun. An exception is Arcturus, the fourth-brightest star in the sky, a spectral K-type giant with a high space velocity relative to the Sun. This is because Arcturus is not a disk star like the Sun, but is instead a halo star that happens to be passing through the disk at this time, as it follows its highly-inclined orbit. While all disk stars rotate in the same direction around the core, halo stars can orbit in any direction. Some halo stars, including Arcturus, have a chemical composition that differs slightly from most Milky Way stars. There is good evidence that Arcturus was born elsewhere, in one of the many smaller galaxies that have been captured and assimilated into the growing Milky Way over time, just as the Sagittarius Dwarf Spheroidal Galaxy is presently being incorporated - the exceptionally luminous globular cluster M54 is believed to have been its nucleus. The Milky Way is no longer thought to have an elliptical galactic bulge, like the Andromeda Galaxy does. Recent composite images of our galaxy, made in the infrared at wavelength of 1 to 4 microns, show the galactic center to be peanut-shaped, which implies that there is a small bar in the Milky Way's core. The bar, mainly composed of the old stars that dominate the centers of spiral galaxies, slowly rotates within an annulus of ionized and molecular gas called the 3-5 Kiloparsec Ring. Infrared studies have revealed a dense cluster of millions of stars at the Galaxy's nucleus. The measured orbital velocities of the stars closest to the center can only be explained if a million-solar-mass black hole lurks at the heart of the Milky Way. Consistent with how well our galaxy has hidden its other secrets from us, black holes were proven to lie at the hearts of many other galaxies before the evidence for one at the heart of our own was found.